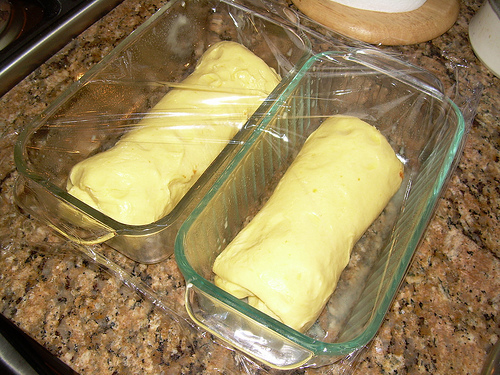 Mrs. Chow's Kitchen » Post Topic » BBA #4 – Brioche, or How Fat Do You Want to Get? BBA #4 – Brioche, or How Fat Do You Want to Get? Going up later today! Friday: Casatiello! On another note, here is a scary article about wheat crops that every baker should read. I tell you, I’ve been having a heck of a time taking photos lately; lighting issues, blurriness, etc., and my brioche and Casatiello photos are no exception. At any rate, I opted for the poor man’s brioche, the bread with the least amount of butter, which is kind of like comparing a woolly mammoth to a whale. It still has a lot of butter, so the diet is out the window. I know because my scale told me so. 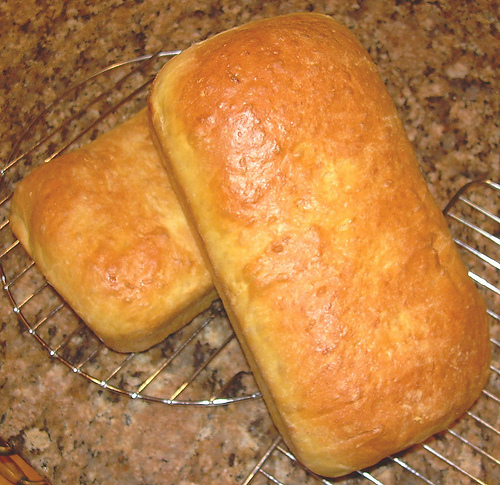 On a happier note, the fragrance of brioche baking is so distinctive once you experience it, you’ll never forget it. I didn’t have any problems making the brioche. We consumed one loaf, and the other one sits in my freezer, waiting for a brunch that I’m hosting in a couple weeks. Yum, what shall I make with it? The possibilities are endless: a strata? French toast? We shall see. You can find a list of those participating, here, and you can find the recipe for Poor Man’s Brioche here. And please check out Susan’s bread baking roundup every Friday: Yeastspotting. is about the loss of all grasses on the globe. I think the answer to that is.. as fat as possible! Beautiful loaves, scary article. I will go hide under my bed when the time comes. Do we get to vote? French toast. Mmm. Then I’ll feel rich to eat a slice of this brioche! Your loaves look really delicious, even if the lighting wasn’t cooperating.